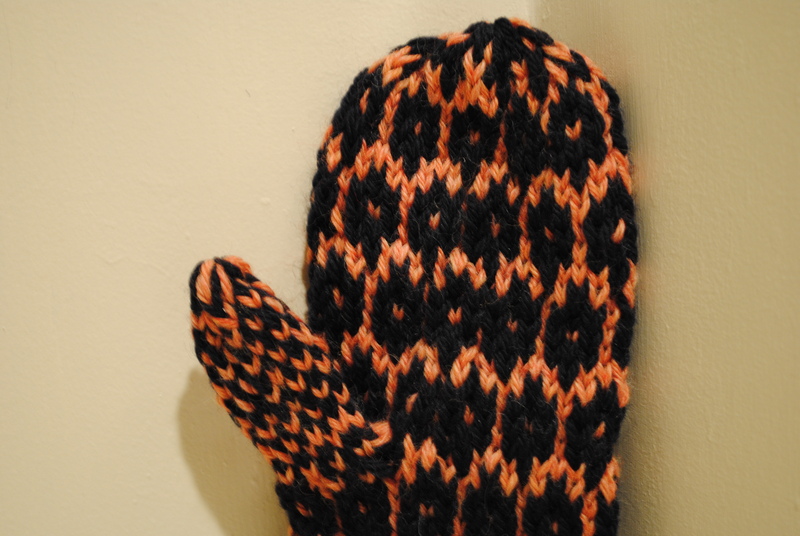 Working on yet another pair of the Neutron Mittens. I’m pretty confident that numero dos will be my last pair for awhile. 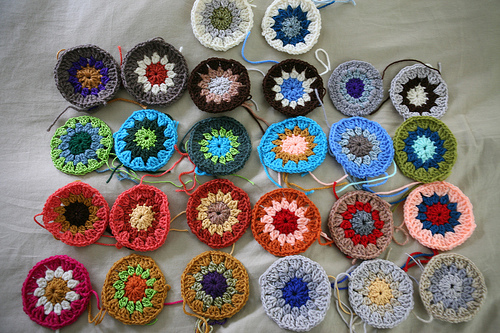 But I wanted to see how much this pattern changed as the colorways changed. You can follow my progress on these mitts at its Ravelry page; better yet, if I buckle down to finish current WIPs this weekend before starting new projects, they’ll be done in no time. As always, more snaps of the Neut Dos mittens at the Isles of Mittens Flickr set. 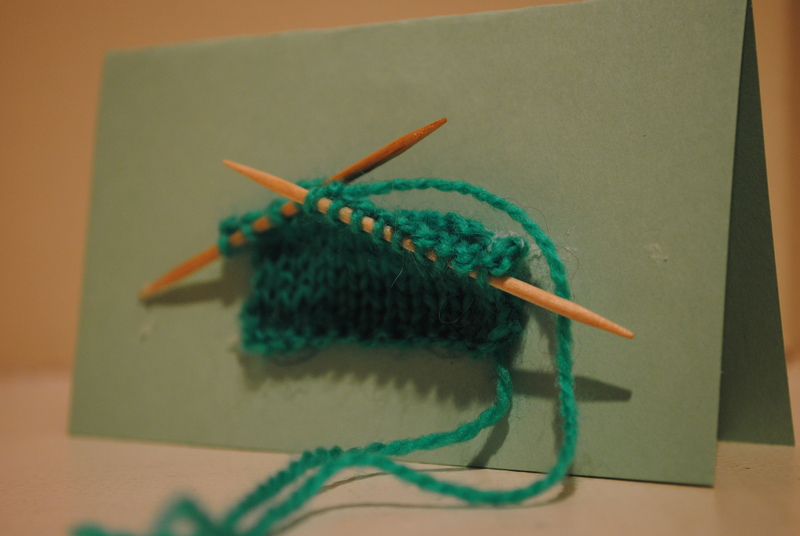 Tiny toothpicks…a new way to knit? I’d seen chopsticks before…but those little pieces of wood to pick at your teeth?! I knit up this tiny bit of stockinette stitch last night as a test; a student came in to see me yesterday and showed me this brilliant little knitted item her older sister created. Basically, she took two toothpicks, some light thread or yarn, and knitted a couple of rows of stockinette stitch onto them. I told her I wanted to try and that I had a box of toothpicks at home, too! And here’s my version. Of course, her sister was much more crafty, gluing little square beads to the end of the toothpicks to make them more like knitting needles. Plus, she glued it really nicely to an index card; mine consisted of little more than slathering a bit of glue onto the card simply so I wouldn’t lose this little wonder. How very cool and very inspired! I’d like to make more of these as thank you cards or some kind of kitsch. Perhaps you could Fair Isle knit in a “Thank You” with color work or something cool. Either way, a splendid outing in tiny knitting. This past Sunday was certainly a funday. I went to Providence for the afternoon to visit my good friends Mackenzie and Jon. While there, I not only spent an arm and a leg on gorgeous yarns at the beautious yarn shop Fresh Purls (go there! seriously), but we got down to the business of shopping around for kitsch and, of course, the one thing we always do during our visits: eat. 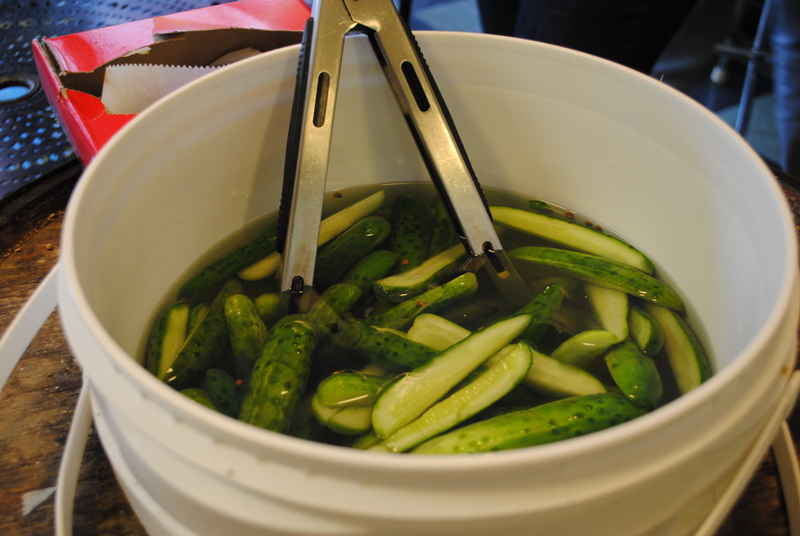 This time around, the dos took me to this amazing sandwich hole called Geoff’s on Benefit with a giant bucket of pickles. Um, perfect for me? Check. 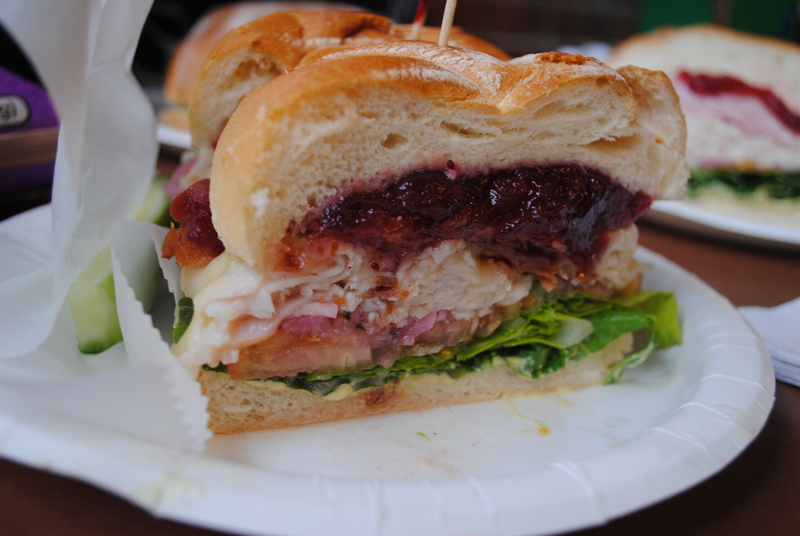 Of course, there were thousands of options with cheeky names and it was hard to decide, but I settled on some sandwich or other that I can’t remember the name of now which featured turkey, cranberry sauce and some delicious special sauce akin to spicy meets honey meets dijon mustard. Double yum. 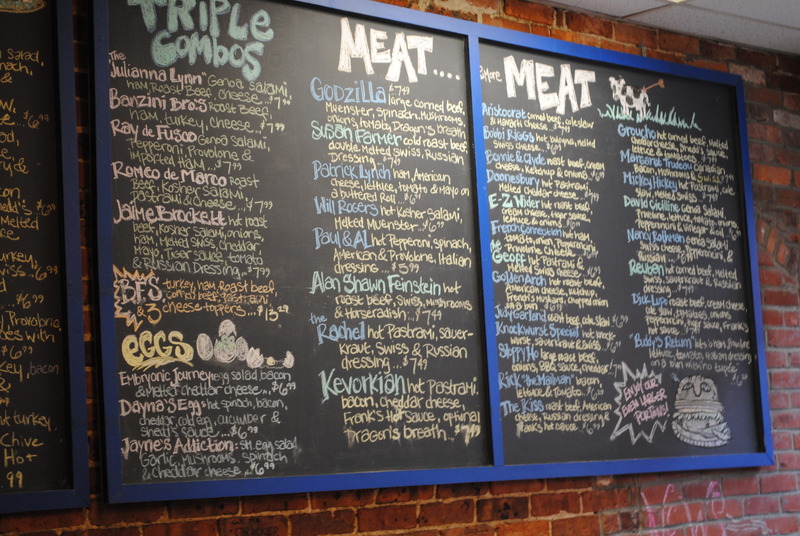 If you’re ever in the area, do check it out. I think, in the coming weeks, when I finish a whole line up of projects currently in the works, I should take some time to get back to my hexagons. Ultimately, I’d like to make the Ruby Hexagon Blanket by Nova Seals, and don’t know if I’ll be able to salvage these hexagons for that project. I might need to use the many, many hexagon already made for something else, like stitching them together as is for some kind of blanket, table runner, bed throw, or even heck, coasters! You can see al the hexagons I’ve let sit dormant for awhile now at its Hexagonal Love flickr set. This chart certainly was the inspiration for one of the latest projects I want to knit up. As soon as I saw it, I was smitten. The pattern is Topaz, freely available in the Spring 2009 issue of Knitty!, a baby dress with this amazing charted detailing at the bottom. My sister’s best friend just had a baby girl and I think she’d look adorable in this little knitted jumper. While visiting my good friends Mackenzie and Jon this Sunday in Providence, I nodded into knit shop Fresh Purls (a wonderful place for yarns and notions I highly recommend!) and picked up the skeins of Malabrigo Worsted I needed for the project. I managed to scoop up the “Golden Ochre” for the peachy detailing but they didn’t have any “Blue Surf” in stock, so I settled for a v. similar “Blue Jewel”, which I think will look splendid nonetheless. I sincerely thought about changing up the color palette but found the baby modeling the little jumper so adorable that I was smitten with a complete redo of that for baby Millylaney. Progress once I cast on later in the week. In the meantime, you can check out the yarn I chose for the project over at the WIPs Flickr Set. One of the items I donated to the Hearts for Haiti shop was purchased on Sunday by a lovely Etsy patron! I am feverishly knitting up her Buttoned Up Neckbone in a dark olive green color with maroon buttons and expect to ship it out tomorrow or Thursday. Remember! My Lace Waist is still available in the Hearts for Haiti shop, so donate away! All proceeds go to Doctors Without Borders. Many many thanks to everyone who supports handmade nation and good causes like Relief in Haiti. Help for Haiti…buy something kitsch! My items are officially listed in the Hearts For Haiti Etsy Collective (pictured as the first two items in the clothing/wearable section)! Please, please go buy something, anything!, from this wonderful shop and 100 % of proceeds will go to Doctors Without Borders to help with relief efforts in the wake of the devastating earthquake in Haiti. What’s more, if you purchase my items, you’ll get free sheeping! Do it! It’s for charity! Some days, when a craving is that good, you’ll rummage through your cabinets and organize t he ingredients. In my case, it was walnut chocolate chip cookies thanks to post-election blues (saddened at the realization that my state went red in the special election) and a serious hankering for chocolate and nut. They pretty much came out phenomenal and I’ve been eating them since Wednesday. Anyone want to intervene? Knitters are doing amazing things to help send donations to Haiti in the wake of the terrible earthquake. I, too, have donated some dollars to Doctors Without Borders, but wanted to also do a bit more. That being said, I have contributed two items from my shop to Hearts for Haiti, an etsy collaborative which sends all (that’s 100%!) 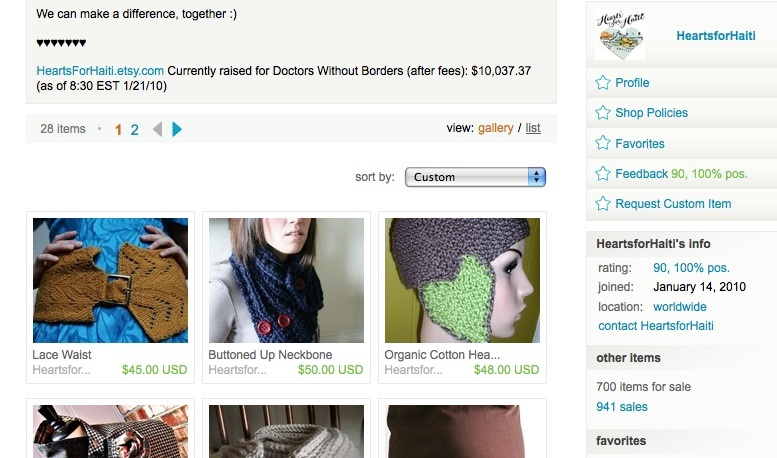 proceeds from sellers’ items donated to Doctors Without Borders. What’s more, if you buy from the collective, you get free shipping on your item and you know all the money you spent is going to charity, and an excellent one at that. If you have a shop and would like to contribute, here are the directions. It’s simple, quick, and you really have no reason not to! The Haitian people deserve it…and need it. I’ll give you a link to my items once they are listed! 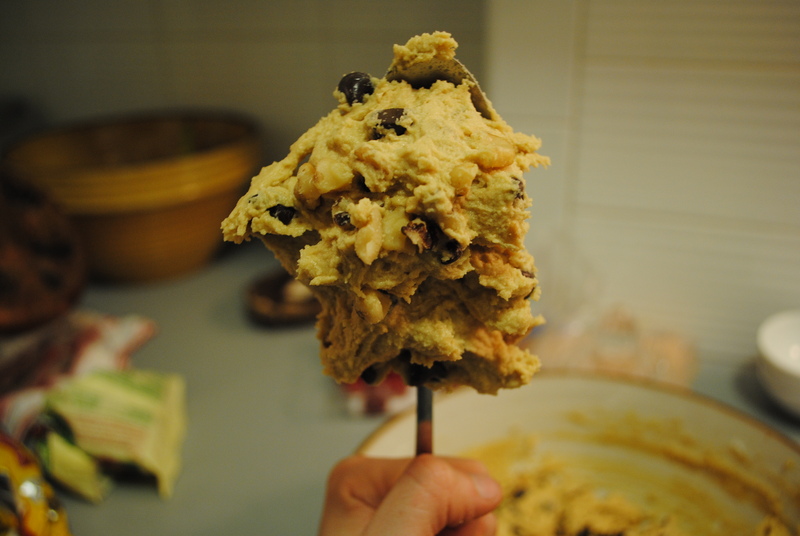 I’ve been taking quite a bit of time for baking of late. Something about winter and being stuck indoors and snow falling aflutter outside makes for a strong desire for strong smells wafting out of the oven. 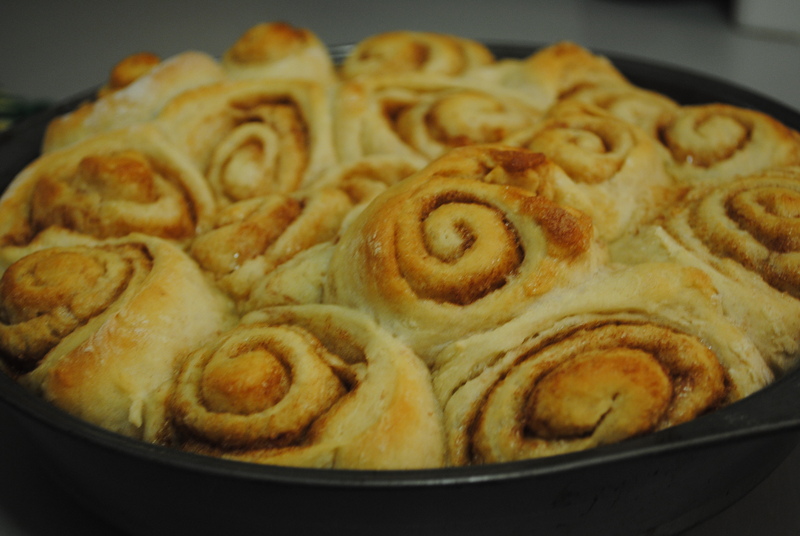 Enter my famous cinnamon buns, which if you like overly sweet desserts, would not be on your list of favorites. The yeasted bread dough is barely sweetened by 1 tbsp. of sugar and the sugary insides are a blend of regular white granular sugar and cinnamon atop mounds of butter, rather than using brown sugar, candied pecans, and all that hoo. What’s more, I’m not a fan of the confectioner’s sugar and milk glaze that goes atop most buns, prefering them to act more like steaming hot mounds of bread than anything else. How do you make your cinnamon buns? Favorite Finds # 2,356: Serif Totes! I absolutely adore this Serif Tote from The Little Factory, which caught my eye at This is Love Forever. It’s deliciously price at a reasonable $24, and when more come in stock at the end of the month, boy do I wantsies. There’s nothing like a simple tote to carry around books, knitting projects, and little bits of candy like I do. Buy it for me? There’s nothing better than the feel of beach stones in winter underfoot. Especially when you’re wearing a pair of handknit socks. And I finally made myself a pair. A simple top down stockinette stitch sock with a ribbed cuff, these socks are super high (think knee high) and super warm. There’s really nothing else to say about them except that you don’t need a pattern to make a similar pair. Just one skein of self-striping sock yarn and a tape measure to check calf size. Of course, these socks are all a part of my attempt at knitting up quick accessories and the like this winter. 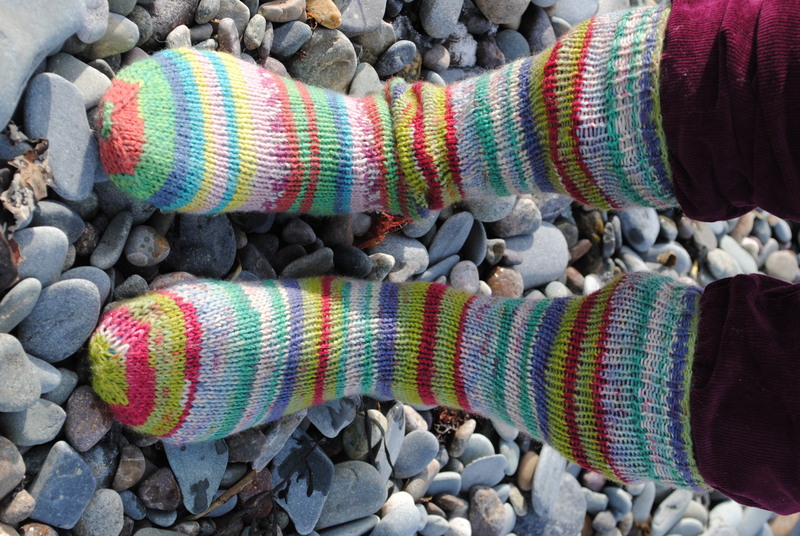 As always, more snaps of the socks at its Flickr Set.